Still working on different types of dining chairs. Still prototype but at least going in the right direction. Backs are 39” tall. Seats are 18-1/2” wide. All Beetle Kill Pine. well my man with great respect I have for your work my vote goes to the second pic of the chair with the curved seat and arms,i don’t think youll disappoint with that buddy,but as always I say go with your gut,and thanks for asking. very nice. I’m always impressed at the range of colour in your wood of choice; It takes already impressive craftsmanship to a new level. Those are really nice. Absolutely beautiful. I plan to tackle chair building one of these days, I’m just not sure I’m ready for the challenge just yet. WOW Really nice build! I particurally like the curved back slats and curved fronts of the seats. A set of six usually has only one chair with arms for the host at the end of the tble. the rest without. Another Winner by Monte, I like the style & contour seat. My friend you are really reaching out. Hope it pays off as well as your western cabin style. The curved staves in the back are a nice touch, I’m wondering about comfort for the back? My thoughts are that if they were reversed they would match the average guys spine. Do you have test subjects of various heights that you can test the comfort level? Another thought is adding the element of the curve to the legs only just a slight curve? But you know your customer base better than anyone else. They do look good. 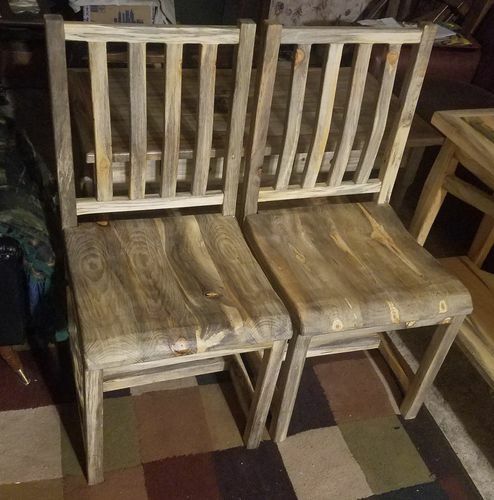 I don’t know anything about building chairs yet, but once I do I’d be proud to make those. Nice design and a very pleasant look. Where they comfortable in the end? Like the looks of the curved seats. Doc, my family pretty much covers the average range of sizes. So they try everything. I am a larger person and it has to be comfortable for me first. As for the curved back, it’s designed for lumbar support just like rocking chairs are. Monte, these are wonderful chairs you have done a great job on them. Great looking chairs. I’d add one armed chair to Russell’s suggestion. For the hostess. Ever think of offering your upholstered seats as an option? Your lumbar region is certainly higher than mine. :-). Great job on the chairs Monte! I like that leather covered seat one. I’ll have to say it’s my favorite because of my not so plump rear. Maybe some arms would look good one that one too! Great job on the chairs Monte! I like that leather covered seat one. I ll have to say it s my favorite because of my not so plump rear. Maybe some arms would look good one that one too!